The Nissan LEAF was recently spotted in an office car park in Kerala. Nissan India confirms the launch of the LEAF EV in India later this year. The Nissan LEAF is expected to cost upwards of Rs 20 lakh. Nissan announced the confirmation during the launch of its Kicks SUV. The Nissan LEAF has been in the news for quite a while now. Rumours suggested it would launch in India last year but clearly, that wasn’t the case. But this year seems to hold more hope for EV lovers. According to a recent report by RushLane and multiple other reports, the top brass at Nissan India announced during the launch of the Nissan Kicks SUV a couple of days ago that the LEAF would launch in India this very year. The Nissan LEAF is a five-door all-electric hatchback that originally launched in Japan and the US in 2010. The Nissan LEAF was spotted in an office car park in Trivandrum as recently as November 2018 by Team-BHP member VivekCherian. This, and other similar sightings of the upcoming EV, give us more reason to believe that the LEAF is really on its way to Indian shores this year. The Nissan LEAF is a hot-selling electric model in Europe but yet to penetrate Asia fully. It’s currently on sale in countries like Singapore and Bhutan. The LEAF Nissan planned for India is expected to be the second-generation model, which was launched globally two years ago. It sports an EM57 electric motor that produces 150 horsepower. It’s powered by a 40kWh lithium-ion battery that takes 16 hours to charge fully on a 3kW charger. 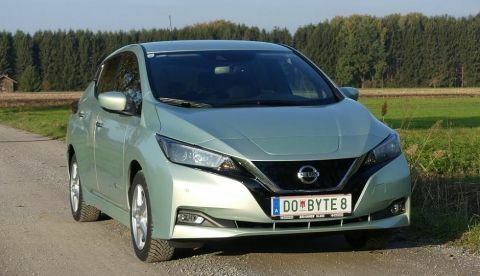 If Nissan offers a fast charging option, the battery should regain 80 percent of the full charge in around 40 minutes. The Nissan LEAF has a claimed range of around 400 kilometres. Apart from the official confirmation of a launch this year, Nissan India disclosed no other information about the upcoming LEAF. When launched, the car is expected to cost upwards of Rs 20 lakh, which is more than twice or thrice the price of most hatchbacks sold in India. This is because the LEAF is expected to be imported to India as a completely built unit (CBU). When launched, the Nissan LEAF will join the short list of EVs currently on sale in India. Its electric competitors will be the Mahindra e2o and the Mahindra eVERITO.